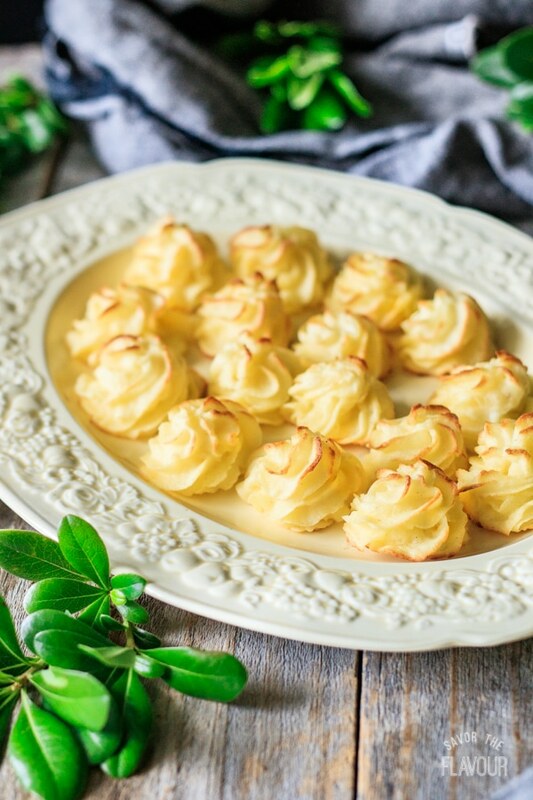 Duchess potatoes are an easy, make ahead holiday recipe that will impress any dinner guest. 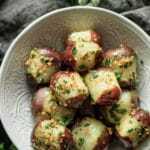 These low carb morsels are baked in the oven and are simple to make. 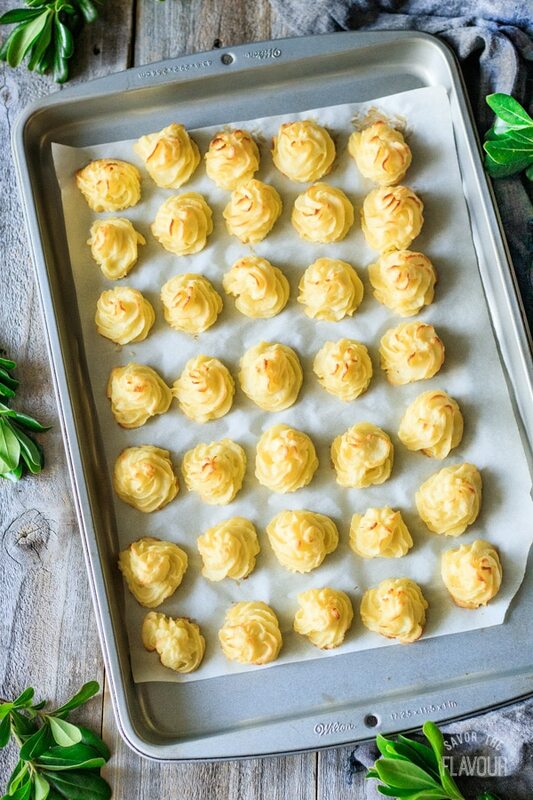 Serve these to your family or for a crowd—either way they are sure to please! The first time I made duchess potatoes was twenty years ago on a very cold January day. We were having friends over for supper, and I wanted to serve something special. I was flipping through a cookbook in my kitchen when the words duchess potatoes caught my eye. In that instant, the thought of warm, velvety smooth potatoes was incredibly appealing. 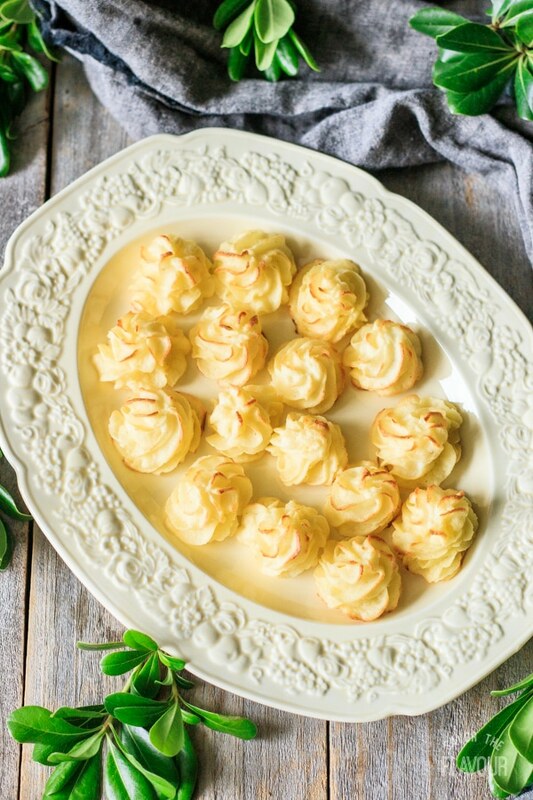 Duchess potatoes are straight from French cuisine and consist of pureed potatoes, egg yolks, butter, and occasionally cheese. 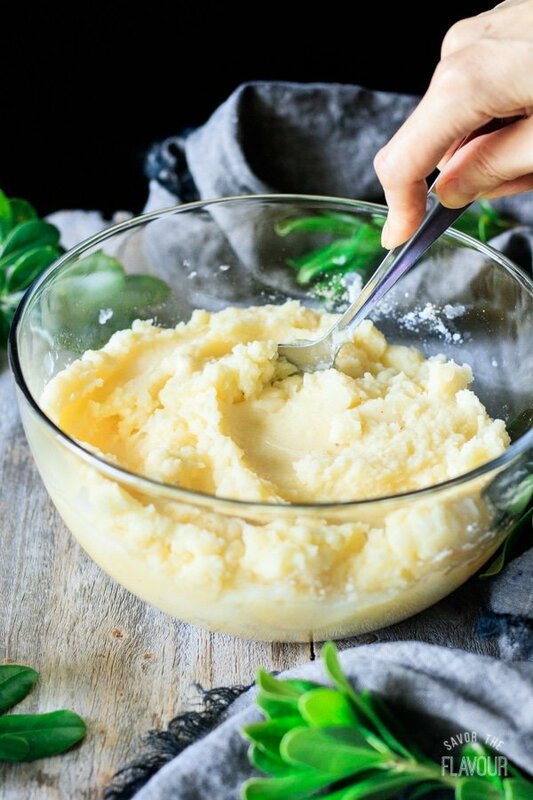 The silky smooth potatoes are first put through a potato ricer, or mashed extremely well. Next they’re piped on a parchment lined baking tray and brushed with egg white. The last step is baking them in a hot oven to give them a nice golden color and to crisp the exteriors. Can I make them ahead of time? Yes, please do. Once the potatoes are piped onto the baking trays, freeze for two hours, then transfer them into a zip-top freezer bag. You can do this up to one week in advance. When ready to serve, place the mounds onto a parchment-lined baking tray and bake. If you happen to have any leftovers, don’t re-freeze. Start by gathering all the ingredients. Wash, peel, and cube the potatoes. 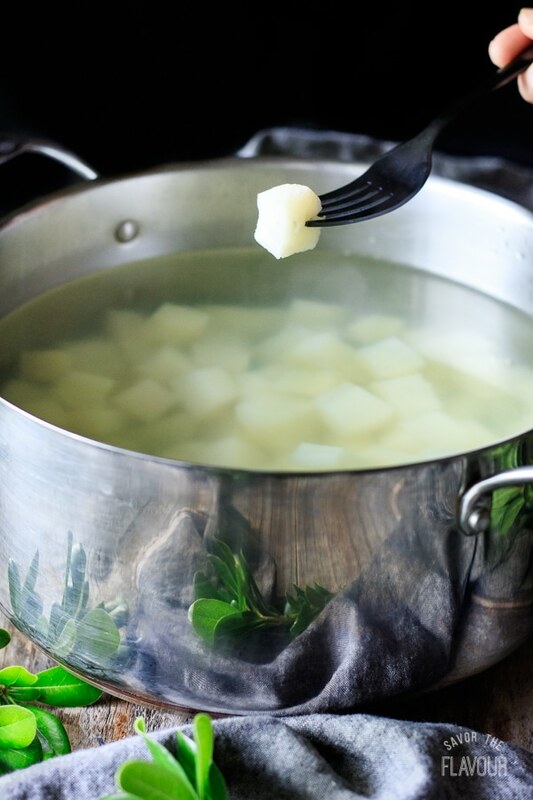 Boil, then simmer the potatoes until fork tender. Drain, then transfer to a bowl. Let the steam release for a few minutes–it will help get rid of extra moisture. Add a few potatoes to the potato ricer. Squeeze the potatoes out into a large bowl. 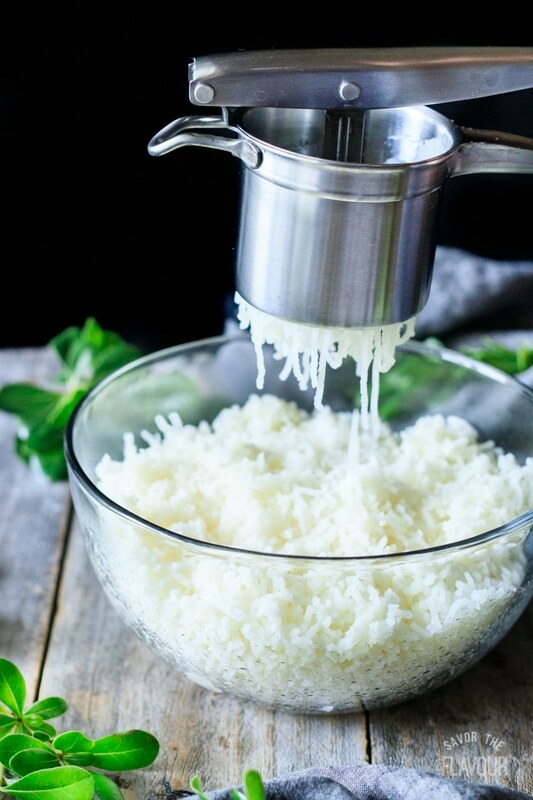 The ricer will make the potatoes silky smooth and fluffy. While still warm, add the egg yolks, butter, cream, and spices. The egg yolks are a binder and help add richness. Put the potatoes in a piping bag with a star tip and pipe onto a parchment-lined baking tray. Freeze for 15 minutes to firm them up, then brush with a whisked egg white. Bake for 25 minutes at 400 F. Serve warm. Want cheese? Try Parmesan, white cheddar, Gruyere, or Swiss. Don’t add the egg yolks when the potatoes are hot or they will start to cook. Want to skip the egg wash? Use melted butter instead. Want fresh herbs? Try dill, chives, thyme, or parsley. Don’t own a ricer? Mash really well or use a stand mixer. Scared to pipe? Practice first by piping onto a cutting board. Don’t want to pipe? Drop in mounds and make a well in the center. 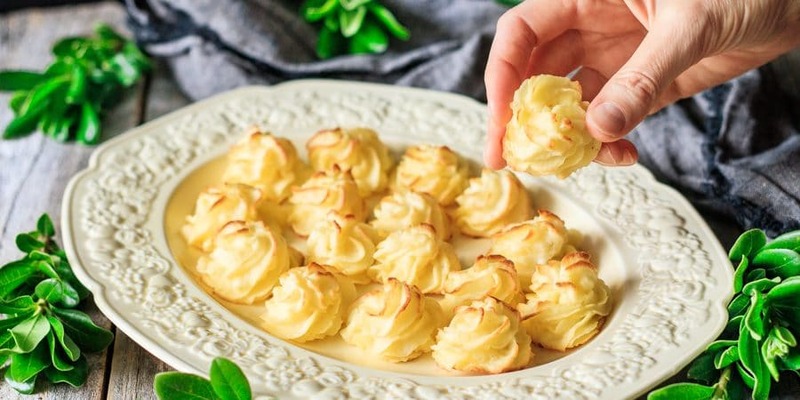 Duchess potatoes are an excellent choice to serve at an elegant meal. They look impressive, but are surprisingly simple to make. These delicious little morsels are a hit every time! 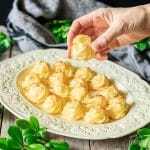 Searching for more delicious potato recipes? These ones will thrill your family and friends. 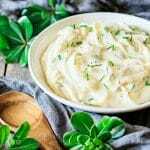 Best Sour Cream Mashed Potatoes: this crowd-pleasing side dish is a family favorite all year round. 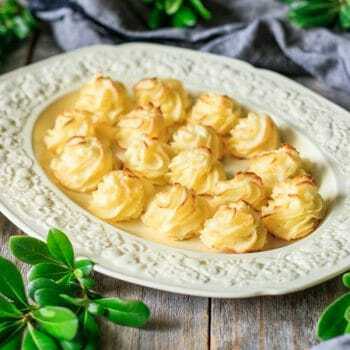 Buttery Garlic Parsley Potatoes: a delicious and elegant potato dish with roots in French cuisine. Cheesy Ham and Potato Casserole: a cozy comfort food that takes just 30 minutes of prep time. Did you make these duchess potatoes? Please leave a star rating below to share how you enjoyed them. Wash, peel, and cube the potatoes and cover with cold salted water. Bring to a boil, then simmer for 12 to 15 minutes or until fork tender. Drain and dump into a large bowl. Let the potatoes release steam for a few minutes as it will help get rid of extra moisture. 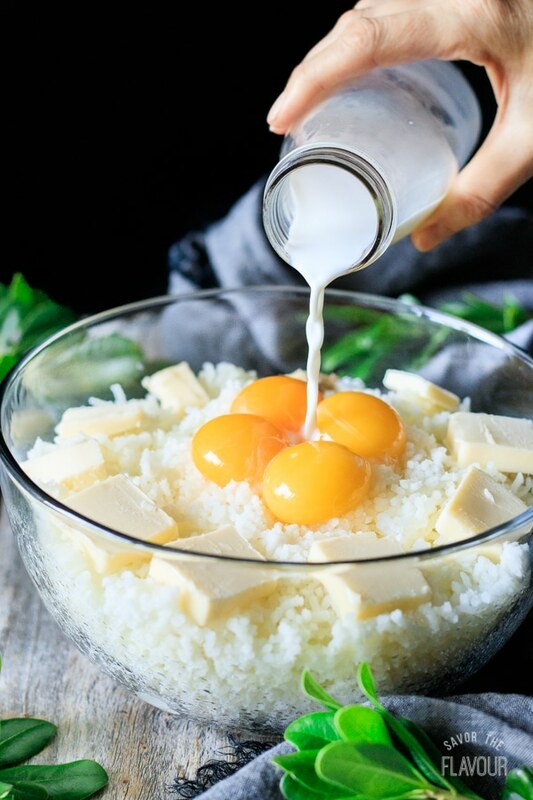 Separate the egg whites from the yolks. 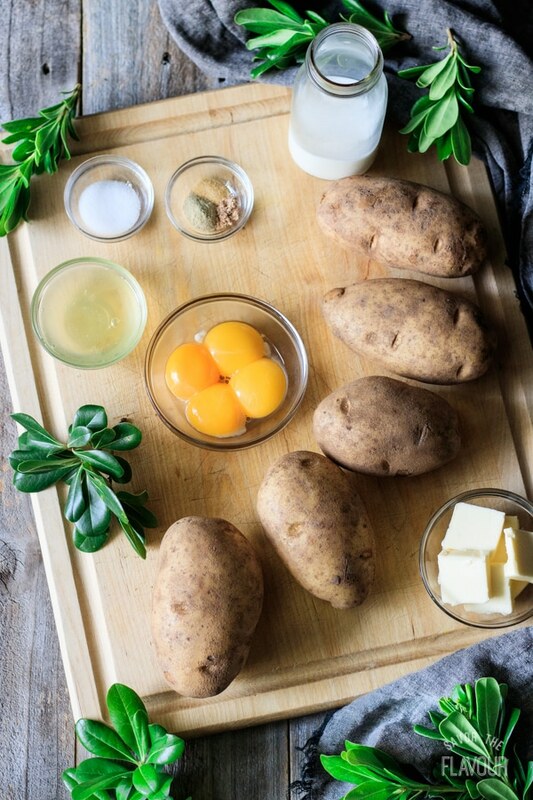 Place the yolks on top of the potatoes and the whites in a small bowl. While the potatoes are still warm, add the butter, heavy cream, salt, white pepper, garlic powder, and nutmeg. Stir until well combined. Adjust seasonings to taste. Snip the corner off a freezer bag and insert a 1/2-inch star tip into the corner. 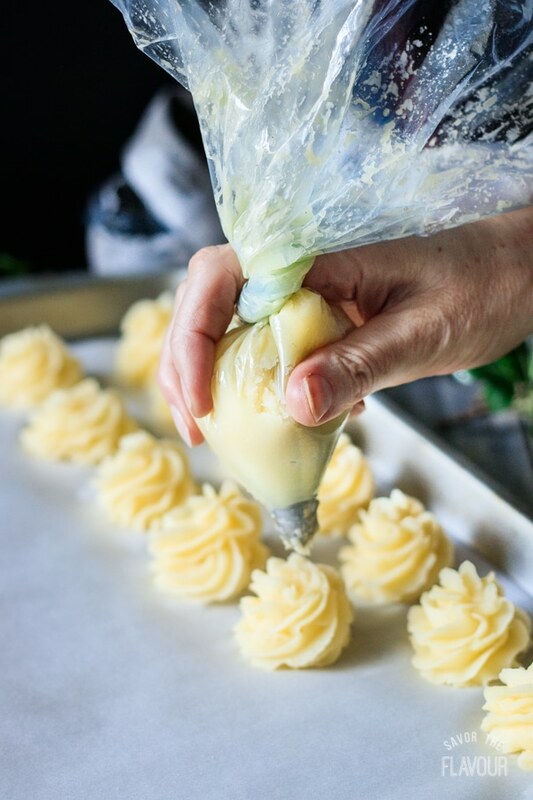 Put the piping bag in a tall, wide-mouthed glass or vase and pull the sides of the bag over the glass to make it easier to put the filling in it. Fill the bag half full, making sure the tip is properly in place. Twist the top of the piping bag until tight. Pipe the potato mixture in spirals on the prepared cookie sheets, making sure to space them evenly. Pipe at a consistent speed, and use even pressure. Chill the potatoes for 15 minutes in the freezer or 30 minutes in the fridge so the potatoes can firm up before applying the egg white. 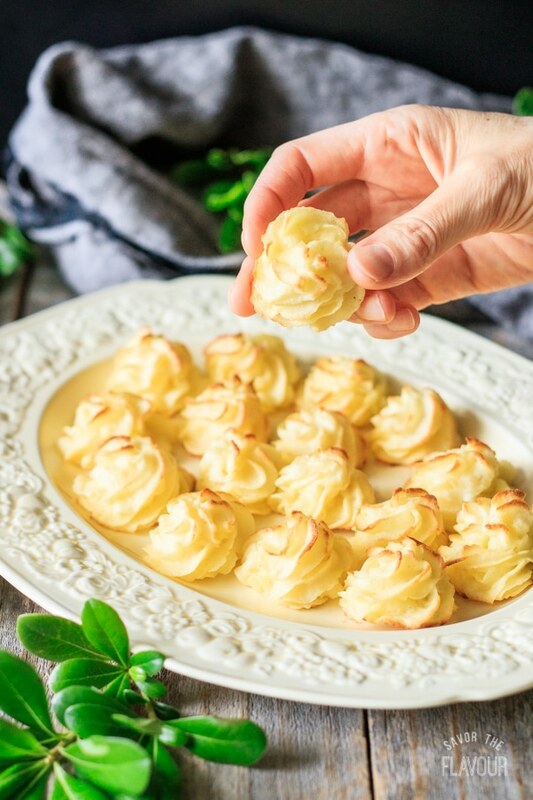 Preheat the oven to 400 F. Once the potatoes have chilled, whisk the egg white and carefully brush the duchess potatoes with it. Bake two trays at a time, each on a separate rack for 15 minutes. Switch the top and bottom trays and rotate for even cooking, then cook for another 10 minutes. Allow the duchess potatoes to cool on the tray for 5 minutes before transferring to a serving platter. Serve warm. Before you pipe all the potatoes, make a few practice ones on a cutting board. 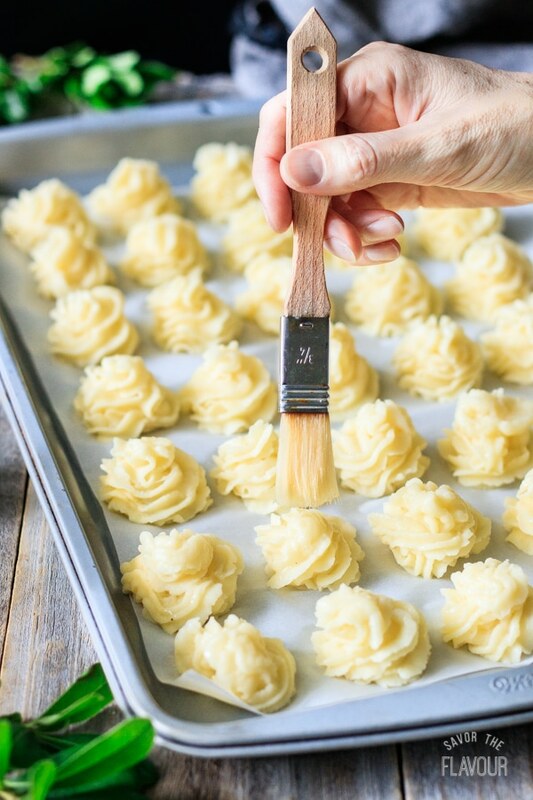 When you are done practicing, just add them back to the piping bag.